Mia von Sadovszky, SVP, Strategic Planning Director, RPA, has spent the past 20 years trying to understand why people think, feel, and behave the way they do, all in an effort to sell things. Now she is the mother of two Gen Zers. She and her team put together a research project, “The Identity Shifters,” designed to understand where Gen Z, those born between 1995 and 2009, is coming from. 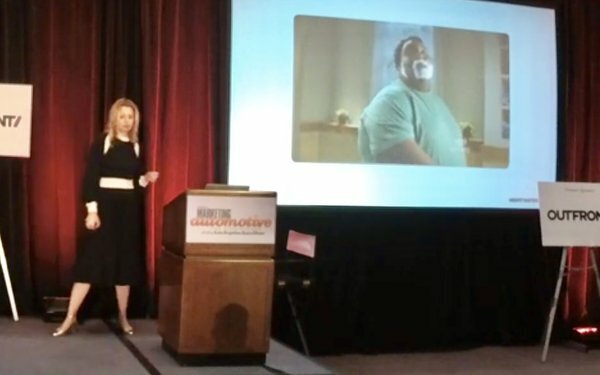 Sadovszky spoke at MediaPost’s Marketing:Automotive conference on Nov. 27, 2018. Today’s world is too multifaceted, too fast-paced for it to make sense to Gen Z to have one true identity. They have to shift and change over their lifetimes in order to be successful. 1. Identity is contextual. It is based on the environment around them to a hyper degree. They are very attuned to group dynamics. They package themselves for audience in front of them, which requires a level of empathy. They like Freedom, flexibility, and being more open-minded. Implication for brands: Don’t be single minded. Gen Z requires less consistency. It is the era of brand identities. Look at the range of ads Apple puts out now. T-Mobile, too. As Gen Zers have multiple IDs, the idea of a subscription car purchase seems like it would be appealing to them. Implication for brands: Truth matters but so does fiction, and storytelling. 3. The no-confrontation congregation. Gen Z hates confrontation. Their watch word is “you do you.” They were raised to be special, different as snowflakes. Theirs is a diverse world. They pride themselves on tolerance, acceptance. They are ambivalent toward taking a stand. They want to maintain social harmony. Being a bully is the worst possible thing. Implication for brands: Leverage the power of group dynamics. Implication for brands: Enable them to be their selves. Would have hated being labeled Soccer Moms and sold SUVs. 5. They’re a little power hungry. They want to rule the group. Among fame, power or belonging, they choose power. You can influence the group, inspire group to behave the way you want it to behave. Peers have monetized their identities. Can do this in your college application. Job interview. Learning how to package yourself. Implication for brands: Don’t just market your brand. Help Z market themselves. That’s the big takeaway of this talk. Raise their profile in real life or on social media. Glossier does this really well with up-and-coming stylists featured on their Instagram page. Reviews, engage this generation in, for example, vehicle reviews.